This has been an interesting week for George Bush. Two days after making a speech in which Communism and Fascism were linked together as totalitarian regimes, as if Lenin and Hitler were one and the same person, we now have the admission that after all the CIA torture flights and medieval torture chambers in Eastern Europe were not figments of the imagination but real-life elements of the Bush regime, a parallel to an off-the-screen nightmare version of the film Hostel. The question is, does George Bush really fool anyone today but himself? How anyone could keep a straight face while a man who purports to being Head of State of a front-line country such as the United States of America, with its excellence for learning, its powerful research facilities, its pools of intelligentsia which in certain areas are second to none, makes a speech deriding Communism and Fascism in the same breath, defies logic. A more fitting comparison to fascism would have been Bushism. After all, how many illegal wars did Lenin launch? None, just the reaction to the Russian Civil War fostered by the USA and other foreign elements once the Bolsheviks came to power. The illegal war against Iraq was launched by Bush, not by Lenin, who invaded nobody. Lenin tried to create a more equal society, the Bush regime operates from a corporate elitist power base. Lenin stood for Peace, Bush stands for War. Lenin was concerned with educating the people, not keeping them ignorant. The Abu Ghraib torture chamber complete with the Great American Heroine Lynndie England sprang up under the Bush regime’s control of Iraq, not Lenin’s. The Guantanamo Bay torture chamber was set up by whom? Did Lenin drop cluster bombs on civilians? Did Lenin massacre civilian wedding parties in Afghanistan? Speaking of which, who destabilised Afghanistan in the first place? Not Lenin. The Marxist-Leninist progressive social regime of Dr. Najibullah was destabilised by George Bush Senior and his cronies Cheney and Rumsfeld, who unleashed the Mujaheddin/Taleban movement, sending Afghan society back two thousand years and ultimately (though indirectly) bringing the Twin Towers crashing down to Ground Zero level. This was the contribution of the Bush family, not Lenin. Lenin stood for women’s rights in Afghanistan, Lenin stood for full employment in Afghanistan, Lenin stood for guaranteed education, healthcare, pension, leisure activities, basic necessities, social mobility and peace in Afghanistan. It was the Bush regime that brought war to Afghanistan. So Bush got his –isms in a twist. 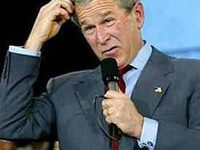 Now that we are on the theme of –isms, how about Bushism? How to define it? Bushism is an acute disease which engenders a delirious form of Governance implemented in a State, whereby the citizens are caught in a wave of manipulation of fear, which in turn attempts to justify Fascist, Imperialist and Expansionist policies based on Machiavellian precepts. The very fact that George Bush is incapable of making a speech without invoking surrealist Demons to justify his diabolical policies could be a telling reminder that either this man is mentally deranged, in the case that he believes what he says, or else he is a manipulative, cynical, political beast of the very worst kind. Unfortunately the truth is neither. He is a well-meaning individual and probably a very nice man who is, and always has been, totally out of his depth as President of the United States of America and the only reason he has ever occupied any position of influence is because his family and the system has placed him there and kept him there. And the tragedy is he is both too weak and too limited intellectually to realise the truth. The only –ism that everyone agrees is evil, except Bush, is Bushism.